Also known as Airport Motel @ Rainbow Point. Situated close to Taupo's town centre, airport and a short stroll to the edge of beautiful Lake Taupo. Enjoy your stay in one of our tastefully furnished country cottage-style units, each featuring a sunny private courtyard, with parking for your vehicle and boat. 7 studios, 6 x 1 and 2-bedroom units. Guest lounge, open fire (during winter months), sunny deck. Small conferences our specialty. Restaurant and dairy adjacent. 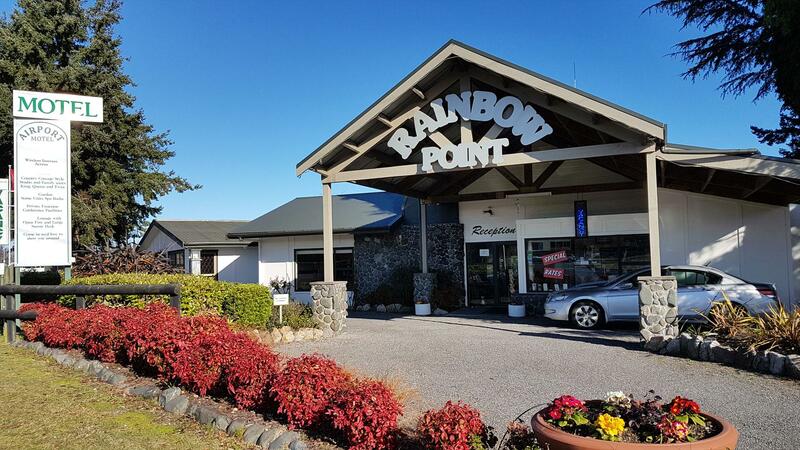 Minimum unit rate may apply..
Also known as Airport Motel @ Rainbow Point. Quiet & Comfortable Situated close to Taupo's town centre, airport and a short stroll to the edge . . . More . . .